I think it’s beautiful. 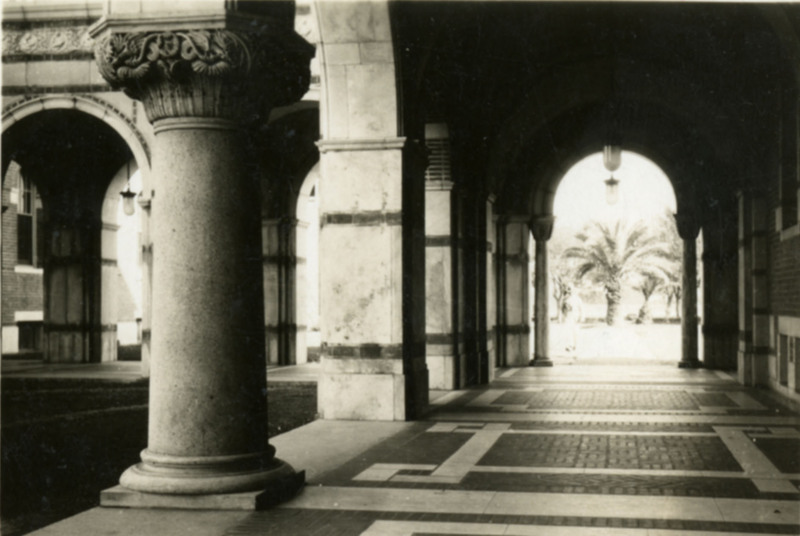 The large palms glimpsed through the ornate cloisters seem exotic and mysterious to me. Dr. Lovett must have loved it too, because he wrote something on the back of the envelope that held it: “Keep. The photograph came from [Rice Professor of French] Mr. Moraud, who is seeking the negative from the foreign visitor who made it. 11 June 1939.” It was still in his desk in 1957. I’m not sure it’s all properly aligned and so forth, plus I can’t help but note that the tip and tail of the arrow aren’t there, but I have to say it really looks good. I do wonder about the zodiac sign for June, though, which to the untrained eye looks quite a bit more like a lobster than a crab. Quite a touching note, really, by Dr Lovett. I think that I might have shed a tear, as a second to his long-term vote for appreciation of the scene. 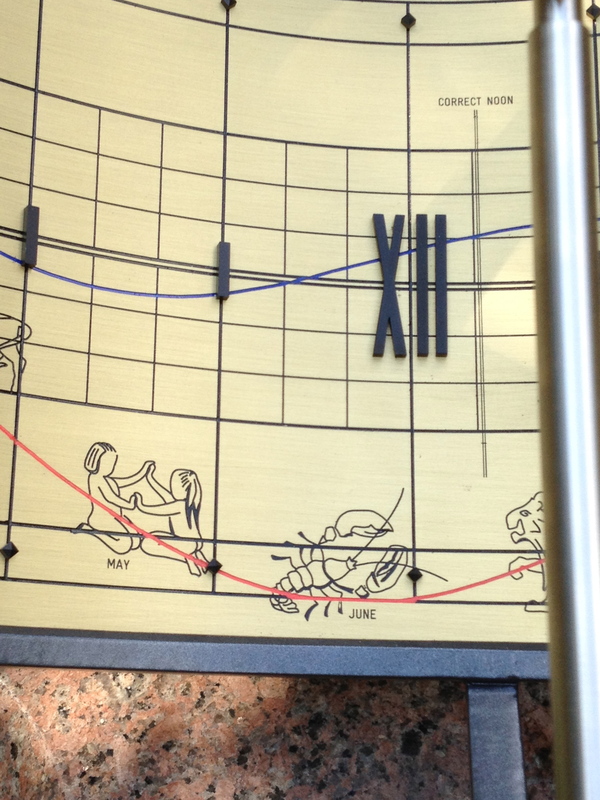 I’d looked at the sundial many times, and never noticed the lobster. That’s very odd, although all of the figures look a little unusual—I’ve never seen a Gemini with seated twins like that. 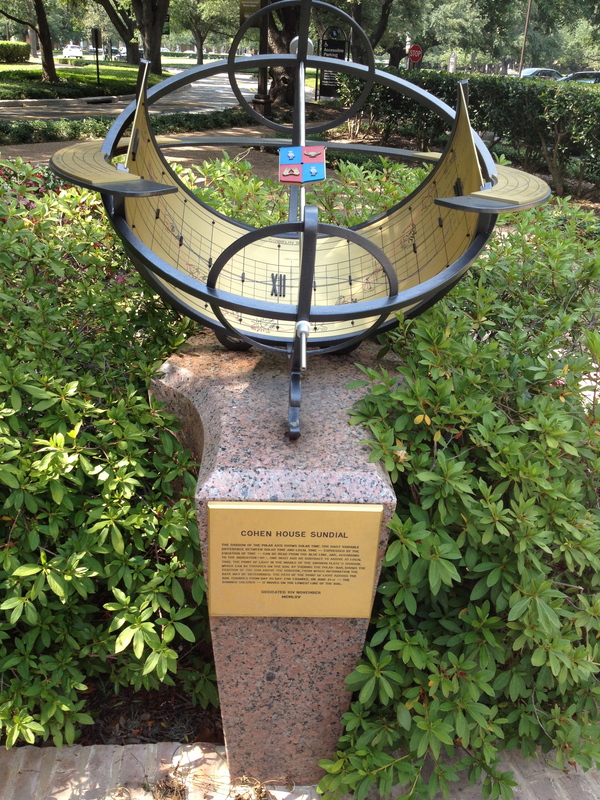 Glad to see it back in its proper place, even with parts still missing. Interesting that it doesn’t really say anything specific about the Zodiac figures in either the invoice or the email, unless they are considered “engravings.” Hmmm. Back to the palm tree! I was very surprised to see it. I thought Teas Nursery had planted Live Oaks on the campus long before 1939. Today there is a gigantic live oak where the palm tree is in the photo. Am I confused?